An undergraduate of the University of Cape Coast, Derek Abrefa, a member of Ghana’s national team, has become a voice for table tennis in the West African nation. 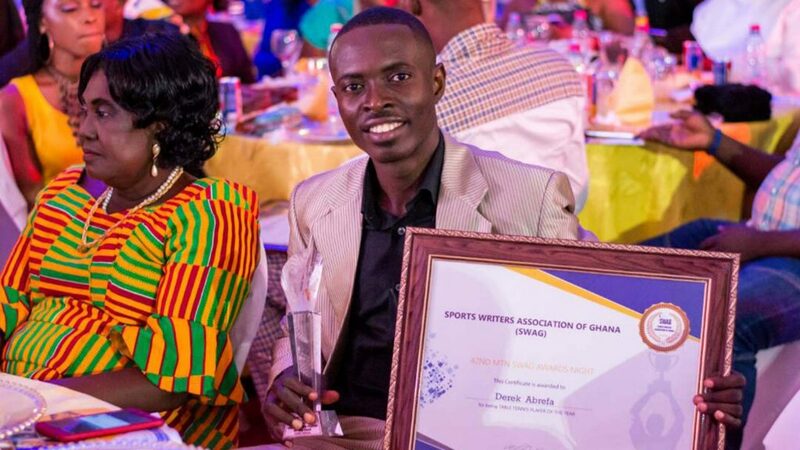 Now, for five consecutive years, he has won the Sports Writers Association of Ghana award as the best table tennis player. Winner of the accolade from 2010 to date, bronze medallist at the 2015 African Games; at the presentation ceremony staged in the Banquet Hall of the State House in Accra on Monday 29th May, he received the decoration from none other than Nana Akufo-Addo, the President of Ghana. A delighted Derek Abrefa, it was also a grateful Derek Abrefa who accepted the fact that the recognition would not have been possible, without the huge support from numerous corporate bodies and national organisations. Furthermore, he acknowledged the individuals who had supported his efforts over many years. A well-deserved award; it is one that promotes the cause of table tennis in the African continent.